Here in our Bride and Wedding section, are faux fur stoles, wraps, shrugs, bags, headbands and much more, perfect for Brides, Bridesmaids, Prom, Party and Evening. Faux Fur is perfect to add an extra touch of luxury and keep you warm. 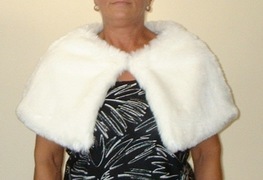 We have a huge range of top quality realistic faux furs. We make all our products in our UK studio and can make any combination/backing/ribbon/size you would prefer.